The demand for inert gloveboxes, otherwise known as isolators or containment workstations has increased dramatically. There are a few reasons for using gloveboxes, these include small-scale manufacturing, research laboratories and product development. An Inert Glovebox is a sealed container that is designed to allow the user to manipulate objects inside of the box by placing their hands in gloves to perform the tasks. The controlled atmosphere within the chamber is usually an oxygen free environment. The box is kept free of oxygen by a continuous purge or flushing and is constantly monitored to make sure the oxygen level stays below the recommended threshold which is usually less than a few parts-per-million. Gloveboxes are excellent solutions for working with air sensitive materials where an oxygen free environment is necessary. They can also be used to protect the operator from harmful chemicals or micro-organisms. Relevant industries for inert gloveboxes include microelectronics, semiconductor, nuclear fuel processors, pharmaceutical, chemical, food processing, government laboratories, laser welding and many others. For precise monitoring of oxygen within the sealed chamber, worldwide glovebox manufacturers and end users alike turn to Southland Sensing Ltd. for their advanced trace oxygen measurement solutions. 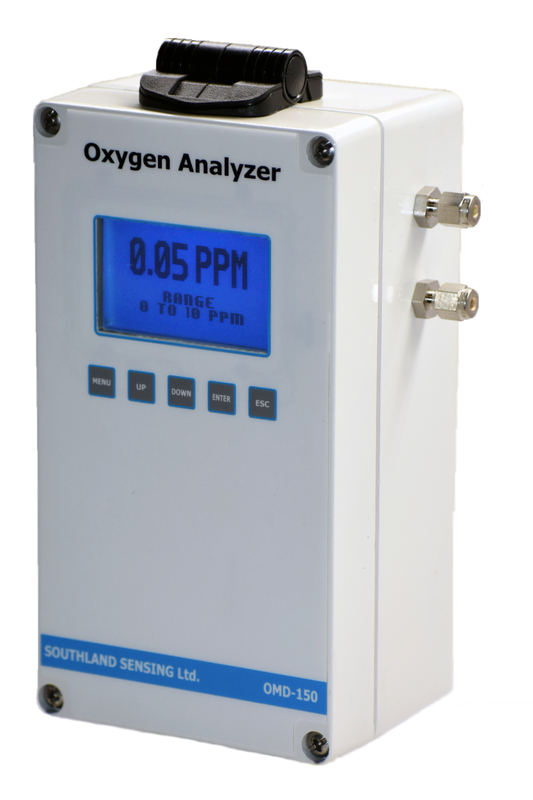 SSO2's trace oxygen analyzers provide continuous and highly accurate monitoring of oxygen levels inside of the glovebox or isolator where even a small concentration change can have detrimental effects. The OMD-501D microprocessor based analyzer is an ideal choice for the continuous monitoring of ppm levels of oxygen in a controlled atmosphere. A full color back-light display shows the oxygen content in real time, two fully adjustable alarms and an analog 4 - 20mA output round out the electronic features. 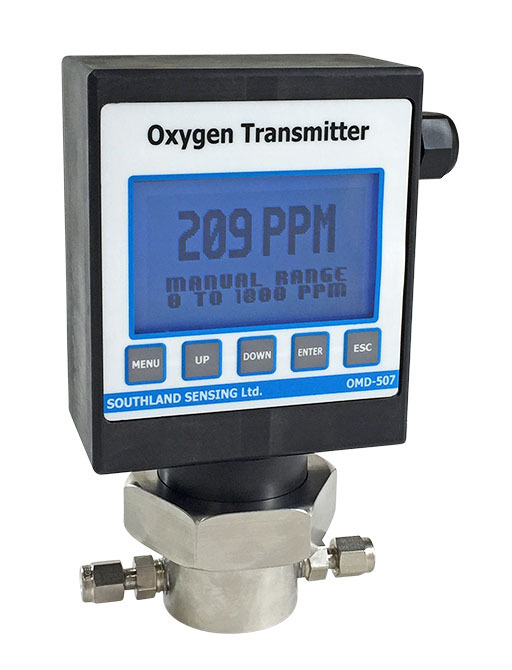 The unit comes standard with a TO2-1x ppm oxygen sensor manufactured in house by Southland Sensing Ltd under a strict quality control program and capable of measuring oxygen down to 100 parts-per-billion. The analyzer is integrated into the glovebox with the H1 KF-40 sensor housing. Other sensors, sensor housing and electronic options are available. For OEM glovebox manufacturers, consider talking with an application expert to see what custom solutions Southland Sensing ltd. can provide. Often SSO2 can provide custom packaging, exotic outputs or other intuitive designs to make your O2 monitoring more reliable and user friendly.